At the invitation of Meng Jianzhu, member of the Political Bureau of the CPC Central Committee and Secretary of the Committee of the Political and Legal Affairs under the CPC Central Committee, and State Councilor Yang Jiechi, Security Council Secretary Nikolai Patrushev of the Russian Federation will visit China from July 26 to 27 to attend the 4th meeting of China-Russia Law-enforcement and Security Cooperation Mechanism and the 13th round of China-Russia Strategic Security Consultation. During his stay in China, Secretary Meng Jianzhu will host with him the 4th meeting of China-Russia Law-enforcement and Security Cooperation Mechanism, and State Councilor Yang Jiechi will host with him the 13th round of China-Russia Strategic Security Consultation. This set of meetings, as an important step to implement the outcomes of President Xi Jinping's state visit to Russia in July and the consensus reached in the two leaders' meeting, will provide new momentum to China-Russia law enforcement security and strategic security cooperation. The 7th Meeting of BRICS High Representatives for Security Issues will be held in Beijing from July 27 to 28. State Councilor Yang Jiechi will host the meeting. This is one of a series of meetings under China's presidency of BRICS this year. Minister of State Security David Mahlobo of South Africa, Minister Sérgio Etchegoyen of the Office of Institutional Security of the Presidency of Brazil, Security Council Secretary Nikolai Patrushev of the Russian Federation, and National Security Adviser Ajit Doval of India have confirmed to attend the meeting. The Meeting of BRICS High Representatives for Security Issues, as a major platform for BRICS countries to discuss and carry out cooperation in the political security field, is very important in enhancing strategic communication, political mutual trust and international influence of BRICS countries. As agreed, this meeting will focus on global governance, counter-terrorism, cyber security and energy security, international and regional hotspots, and national security and development. At present, against the background of the intricate global geo-political factors, escalating regional hotspots, rising cyber security threats and terrorism, and intertwined traditional and non-traditional security challenges, China hopes that this meeting will help safeguard the common interests of the BRICS countries, move forward political and security cooperation between BRIC countries, strengthen the BRICS solidarity and influence, and make good preparations for the Xiamen Summit in September. Q: The 8th meeting of the Iran-P5+1 Joint Commission, overseeing the implementation of the Joint Comprehensive Plan of Action (JCPOA) was held in Vienna on July 21. Did China attend the meeting? How do you comment on the outcomes of the meeting and the implementation of the JCPOA? A: The 8th meeting of the Iran-P5+1 Joint Commission overseeing the implementation of the JCPOA is of significant meaning in that it was held at the two-year anniversary of the JCPOA. Director General Wang Qun of the Department of Arms Control of the Foreign Ministry led a delegation to the meeting. The implementation of the JCPOA was reviewed, and all parities welcomed the IAEA's recognition of the measures taken by Iran in the nuclear field, commended the positive progress made in the reconstruction of the Arak heavy water reactor, and stressed the importance to faithfully execute relevant clauses on lifting sanctions. All parties pledged to continue their compliance with the deal and ensure its comprehensive and effective implementation in a constructive environment. 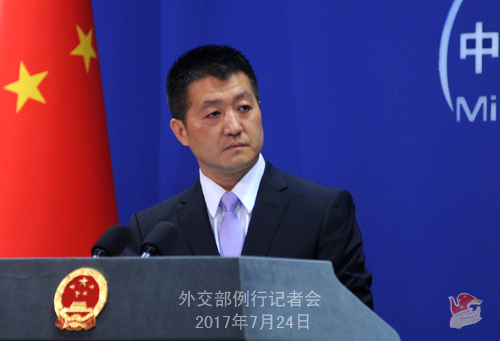 China believes that the JCPOA is an important outcome of multilateralism and a good example of resolving international hotspots, including proliferation issues, through political and diplomatic means. Under the current circumstances, we hope that all parties could toughen the political will, faithfully fulfill their duties, properly handle differences, and support and uphold the JCPOA. Q: Chairman Gen. Joe Dunford of the US Joint Chiefs of Staff American forces said on July 23 that the US can defend the limited missile attack from the DPRK. He called a military solution "horrific" and said that "anyone who has been alive since World War II has never seen the loss of life that could occur if there is a conflict on the Korean Peninsula". What is your comment? A: I have noted relevant reports. China always maintains that military options shall never be considered to resolve the Korean Peninsula issue, because force will in no way settle disputes, but will only bring greater suffering, unbearable to all. We sincerely hope that all parties could avoid actions that might escalate tensions and make the situation even worse. Not too long ago, based on the dual-track approach and suspension-for-suspension proposal of China and the step-by-step vision of Russia, a joint proposal was raised in the joint statement issued by the two foreign ministries on the Korean Peninsula issue, which is meant to address both the root causes and the symptoms and use a holistic approach to resolve the Korean Peninsula issue. We hope all parties can give careful thoughts to and endorse such reasonable, legitimate, practical and feasible plan and seek a practical way out of the Korean Peninsula issue. Meanwhile, we hope that all relevant parties, the US and the DPRK as two direct parties in particular, must make their political decisions as soon as possible and work together towards deescalating tensions on the Peninsula and politically resolving the Peninsula nuclear issue through dialogues. Q: Will there be any bilateral meetings during the BRICS High Representatives Meeting for Security Issues? A: I have just talked about the 7th meeting of BRICS High Representatives Meeting for Security Issues. As for what you asked, I have no relevant information now, but in the past, the host countries made some arrangements for bilateral meetings with the heads of other delegations to exchange views on bilateral relations, BRICS cooperation and multilateral affairs. Q: Could you offer more details on the agenda of the meeting? Will senior Chinese officials meet with other delegates? A: I have answered about bilateral meetings during the BRICS meeting on security issues. I have nothing more to add. Q: The Trump administration has made clear in the last couple of days that they are seriously considering and highly likely to put sanctions on a number of Chinese entities and banks that do business with the DPRK. Are China and US working together for a solution to the Korean Peninsula nuclear issue? A: I believe you are very clear with our position on the Korean Peninsula nuclear issue and sanction-related issues. I can summarize it as such that as a permanent member of the UN Security Council, China consistently abides by its international obligations and duties, including the strict and clear responsibilities on all UN member states spelled out in the resolutions adopted by the Security Council. 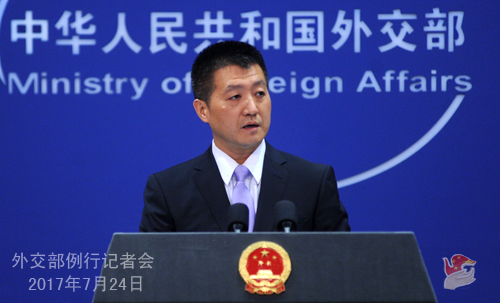 However, we do not approve of the unilateral sanctions imposed by any country in accordance with its domestic laws and oppose "long-arm jurisdiction" exercised by the US based on its domestic laws which jeopardizes China's interests. As for cooperation between China and the US on the Korean Peninsula nuclear issue, as two permanent members of the UN Security Council, China and the US shoulder important responsibility in maintaining international and regional peace and stability. We also hope that China and US can cooperate effectively on the basis of mutual respect and contribute constructively to properly resolving the Korean Peninsula nuclear issue in a political way and preserving regional peace and stability. I want to stress again that effective international cooperation must be grounded on mutual respect. We hope that the US could bear this in mind and work with us in the same direction. Follow-up: If the US launches unilateral sanctions, what is China going to do? A: we have made our stern position clear. Q: You said that the BRICS meeting on security issues will discuss hotspot issues. Will the China-India stand-off in Donglang be featured? A: I have given you some information about the BRICS meeting on security issues and talked about the arrangements for the meeting. I have nothing more to add. 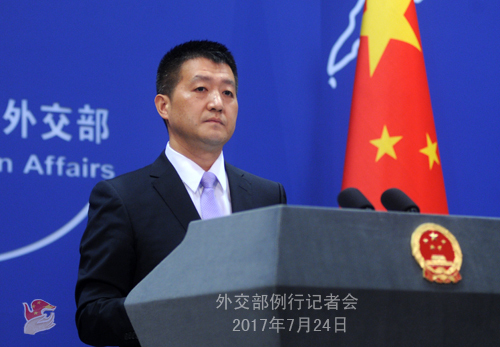 As for the incident in Donglang as you mentioned, you must be clear with our position which has been repeated many times. We can reiterate that the root of the current problem is that Indian border troops still linger illegally on China's territory. We once again urge India to get a clear picture of the current situation and withdraw its border troops back to the Indian side of the boundary. That would be the prerequisite and basis for any meaningful dialogue to happen between the two sides. Q: According to the Indian Times, Australian Foreign Minister Bishop discussed the China-India standoff incident in Donglang with India during her recent visit there, saying that this is a long-term dispute and territorial disputes should be resolved peacefully, and Australian would not like to see an escalation. What is your comment? A: I have noted relevant reports made by the Indian press. First of all, I want to point out that what Ms. Bishop said about peacefully resolving territorial disputes as a principle is true, but I must add that what she said is not applicable to what is happening in Donglang, because there is no territorial dispute there. The Sikkim section of the China-India boundary is long-defined, a fact recognized and maintained by the two sides for 127 years without any dispute. The nature of this incident is that Indian border troops illegally crossed the already delimited Sikkim section of the China-India boundary into the Chinese territory, which is essentially different from the past frictions between the two sides in sections that are yet to be delimited. China wants peace and stability in the China-India border areas, but make no mistake, that does not mean we will compromise in any way on the issue of territorial sovereignty. The responsibility for this incident is solely on India's side. We once again urge India to get a clear picture of the situation and take measures as soon as possible to avoid further escalating the situation. Q: First, according to Xinhua news, a cinema is now up and running on Yongxing Dao in the South China Sea. Some people believe that this is a move by China to enhance its actual control over the island. What is your comment? Second, China-Russia joint naval drill has already begun. This is the first time for the drill to be held in the Baltic Sea, or to put it another way, to be held in the inner waters of Europe. What is the purpose of holding the drill in the Baltic Sea? A: On your first question, there is nothing to question about when China built a cinema on its own territory, and I believe the same is true for Japan or other countries. That is essentially different from building on lands snatched away from other countries. 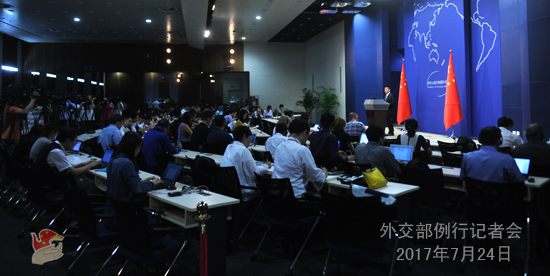 On your second question, the Spokesperson of the Defense Ministry of China has already given a response. It seems that no country has said that it violates international law. Q: The UN Special Representative on Human Rights in the DPRK said that he was alarmed by the detention and forced repatriation of the DPRK refugees and urged China to stop repatriating them. Do you have a comment? A: We want to inform the relevant person that those from the DPRK who illegally crossed the border to China are not refugees. They violated Chinese laws by illegally entering China. The Chinese government always properly handles the illegal entry of the DPRK citizens in accordance with domestic and international laws and on humanitarian grounds. We urge the UN human rights agency to abide by the purposes and principles of the UN Charter, discharge its duties in an unbiased and objective way, and respect the normal law enforcement work of Chinese judicial authorities. Q: State Councilor Yang Jiechi and Indian National Security Advisor Mr. Ajit Doval who will attend the BRICS meeting on security issues are also special representatives of the boundary talks between China and India. Can we expect a solution of this problem between the two countries during this meeting of the BRICS security advisors? A: As I said, the 7th meeting of BRICS High Representatives for Security Issues is a regular gathering for multilateral activities. Representatives from relevant countries will attend the meeting in their appropriate capacity. Q: The Canadian Embassy on Saturday put on a statement saying that two Canadians are detained in China. Some media reports added that these two were detained for marijuana charges. Can you confirm this and can you also confirm what is China's legal policy when someone in China is detected to have marijuana in their system? Is there a way to check whether they are using marijuana in China or before they arrive in the country? How are they going to be treated in these two difference scenarios? A: I have no relevant information. I need to check on that and get back to you.